Get beauty tips and travel must-haves from Giorgio Armani Face Designers, Rhona Samuels at Fab Over Forty. This year, get your Mother’s Day gifts while giving back at the same time. Jackie Silver from AgingBackwards.com shows you win-win Mother’s Day shopping. Prime Beauty has curated a selection of 6 feminine and sophisticated fragrances complete with elegant falcons perfect for Mother’s Day. She’s even giving one away! You’re welcome. Her first time ever in a 2-piece! Check out her amazing before and after photos on Fab Over Fifty. 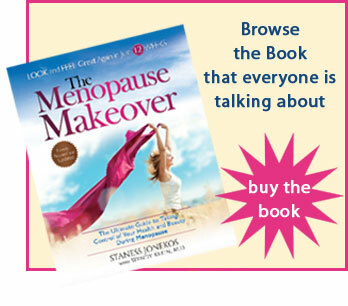 Menopause Makeover secret weapon to weight loss – FIBER! The USDA recommends that you get at least 25 grams of fiber a day, but most of us consume less than 10 grams per day. Are you eating enough? Plus Size blogger shows plus size women that wearing a bikini can increase self-esteem. What does your thigh bone have in common with the Eiffel Tower?Boomer fitness guru Mirabai Holland has the answer. Hint: think honey combed. Are you looking for tasty fat loss recipes? Ones that don’t have you looking for obscure ingredients or that your family will happily eat? Female Fat Loss Over 40 expert has a solution for you HERE. Positive Aging Expert Barbara Hannah Grufferman thinks every woman in American needs to start doing push-ups….NOW! Click here to find out why. Deb of No-Nonsense Beauty Blog fights aging with fish. And ladies, if you haven’t already signed up for your chance to win a $500 Mother-Daughter Gift Basket this month, go take care of that now by clicking here.